Winter has arrived and the cold temperatures and dry air can play havok on your skin. It's extremely important to keep your skin soft and moisturized in the winter months. Possibly even more important than it is in the summer months. For 75 years, people have come to love the healing power of Carmex lip balms. Now, Carmex is offering skin care products that help soothe, heal and moisturize your dry skin! I can't rave enough about how the Carmex healing cream and lotion made my skin feel. My skin was so soft and smooth. It didn't leave my skin feeling slimy or greasy either. I used my lotion on my arms, hands, legs and feet. It is perfect for head to toe use and everywhere in between! A small amount goes a long way - just a dab will do ya! The scent is perfect, not over-powering like so many others, very soothing and pleasant. Perfect for men, women and children. Carmex created Carmex Skin Care as a solution to help heal, soothe, and moisturize your dry skin. Carmex skin care has a non-greasy feel, quality ingredients, and is effective. Suggested Retail price is for a Full Size Tube is $5.99 and smaller tube is $0.99. They are currently available at Walgreens, CVS, and Walmart. The Carmex Healing Lotion can be used anywhere you have dry skin and with daily use can protect skin and prevent dryness. Its rich healing ingredients include aloe & vitamin E and it comes in both tube and pump form for easy use. 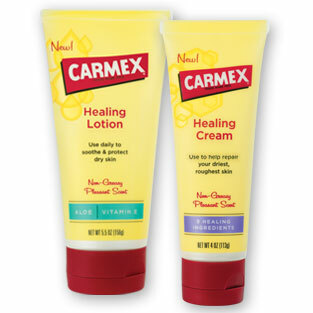 Carmex Healing Cream targets really dry skin, such as elbows, hands, knees, and feet. With 9 healing ingredients, it works to penetrate and repair dry, rough, and cracked skin. I would love to try the Moisture Plus Sheer Berry. I would love to try the healing cream. I would like to try the healing cream on my feet!